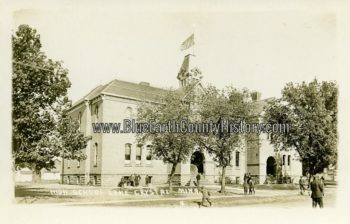 Excerpt from The Heritage of Blue Earth County by Julie Schrader, Topic 90, available in the Research & Genealogy Center. “The village began o grow when in September if 1856 Mf. Folson acquired another partner, Eri P. Evans. They built a mill dam across the Watonwan River and Eri Evans built a store and was appointed postmaster of the small village. 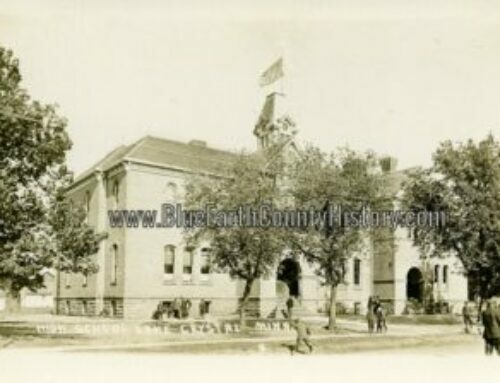 Other building was going on also in 1856 with the completion of a schoolhouse, sawmill, flour mill, and several houses. ” Benjamin H. Seabury conducted the first store in the village in a tent during the summer of 1856. A short time later he sold out to Cheeney and Harrington. One year later, C.B. Fraser opened a store there. In 1859, James Besser and Thompson engaged in the mercantile business. In 1860, T.N. Boynton opened a store in the village and in 1861 John Ray and Daniel Williams started another mercantile establishment. “In October 1858 the village of Fremon was replatted and renamed Garden City by Samuel Folson, Amos Warner, John Dilley, Cyrus Foot, James Wisewell and Edson Gerry. 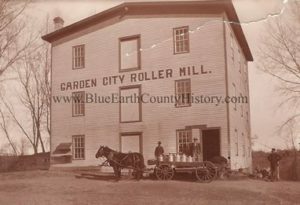 “Business thrived in the late 1850s and early 1860s, especially in the area of milling.